Follow these directions to configure the IP address and subnet mask on a Cisco router or switch in IOS. Note: The VTY (virtual terminal lines) are used to connect to the router or switch remotely, via SSH or telnet. Because VTY is virtual, there is no physical interface on the router for the VTY interface. When making a VTY connection to the router or switch from a computer in the LAN, the connection flows through the Ethernet LAN interface, which is probably GigabitEthernet0/1. When making a VTY connection to the router or switch from a computer over the WAN, the connection flows throughthe Ethernet WAN interface, which is probably GigabitEthernet0/1. It can be helpful to recognize that a router or switch will have at least two cables connected, one going to the LAN (probably GigabitEthernet) and the other going to the WAN (probably Serial). For IPv6, type ipv6 address xxxx:xxxx:xxxx:xxxx:xxxx:xxxx:xxxx:xxxx/64 and press enter (example: ipv6 address 2001:DB8:1:1::1/64). Also type ipv6 address FE80::1 link-local and press enter. Type no shutdown and press enter. This changes the interface state from down to up. Type description cable connection on interface on device to interface on device (example: Ethernet connection on G0/1 on R1 to G0/1 on S1). In human speak, this is saying that an Ethernet cable is connected to the Gigabit interface 0/1 on Router 1 to the Gigabith interface 0/1 on Switch 1. 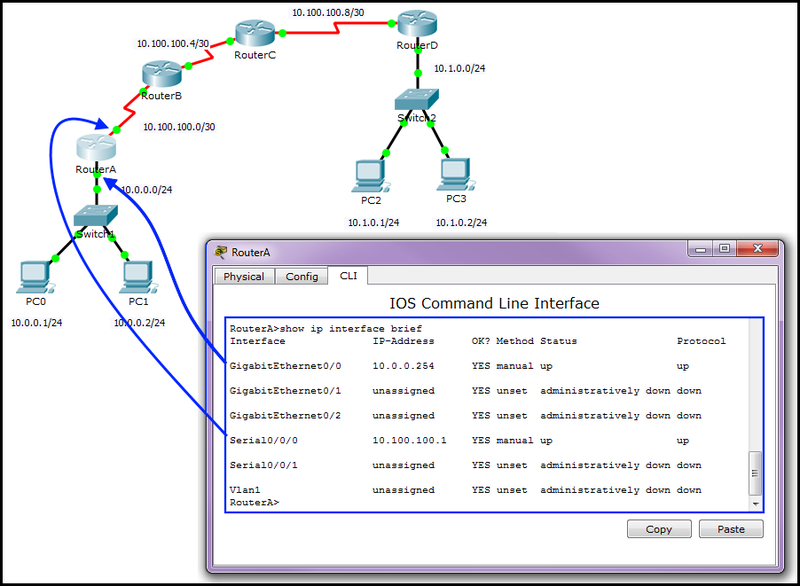 Command show interface interface shows details information about an interface (example: show interface FastEthernet0/1).. The reload command can be used to return the switch to the configuration it had before any changes were made. To ensure these changes remain saved if the switch is restarted, save the changes to the startup-config. In IOS, type enable and press enter to enter priviledge mode. Type copy running-config startup-config and press enter. This saves to NVRAM. To ensure the startup-config contains the IP address and subnet mask, use the show startup-config command. It is also possible to save the changes to flash using the copy startup-config flash command. Then use the show flash command, and the startup-config file should be listed.